Offices across NOAA have collaborated to develop an agency-wide Ocean Noise Strategy, which seeks to ensure that NOAA is more comprehensively addressing noise impacts to aquatic species and their habitat over the next 10 years. The Roadmap is intended to serve as a high-level guide, rather than a prescriptive listing of program-level actions. The document summarizes the status of the science to support the Ocean Noise Strategy's goals, details relevant NOAA management and science capacities, and recommends cross-agency actions that could be taken to achieve more comprehensive management of noise impacts. Fundamentally, the Roadmap serves as an organizing tool to rally the multiple NOAA offices that address ocean noise impacts around a more integrated and comprehensive approach. A series of key goals and recommendations are presented that would enhance NOAA’s ability to manage both species and the places they inhabit in the context of a changing acoustic environment. Public comments were accepted through July 1, 2016. We thank you for your feedback and have worked to address the comments received in revising the draft Roadmap. A summary of the responses to common themes appearing in the comments and changes made can be viewed here. 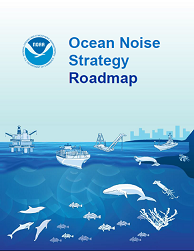 With the Roadmap finalized, NOAA will continue to work towards achieving the Ocean Noise Strategy's goals, including through implementation planning within each of NOAA's line offices.